We use drip irrigation systems wherever possible – the most efficient way to deliver water to plants. Drip systems reduce water waste, water cost, and plant disease, and there’s no overspray on paved areas or building structures. 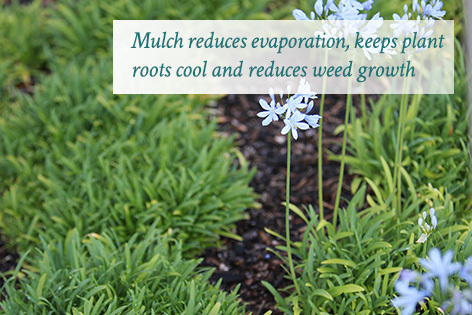 We use ground cover and mulch in planter beds – reduces evaporation and retains water in the soil. Adds nutrients to the soil, too. We use drought-resistant plants where possible. 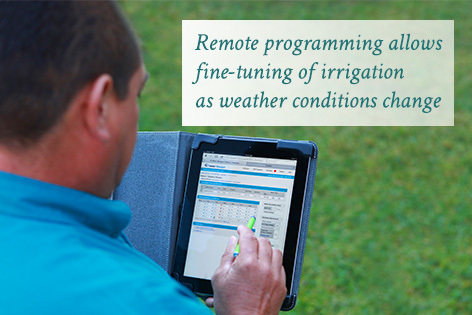 We use Smart Irrigation Controllers and Rain Sensors – reduces water use by fine-tuning irrigation to plants’ precise water needs. Shuts off irrigation during rain. We water between 12:00 am and 6:00 am – cooler temperatures reduce evaporation and allow water to penetrate deeply to roots. Calmer winds allow water to be delivered efficiently to plants, not blown onto pathways and buildings. We program multiple irrigation cycles – long, single applications of water can create runoff and waste. Shorter, multiple cycles allow time between cycles for water to penetrate more deeply into the soil. We inspect and adjust sprinklers weekly – ensures efficient delivery of water to plants. We repair broken sprinklers and lines immediately – reduces water waste and damage to plants. We use master valves on major irrigation lines – electronically-controlled automatic shut-off prevents water waste in the event of a broken line, valve or sprinkler. We watch for and prevent water runoff. We aerate lawns to help water and nutrients penetrate deep to the roots –promotes a healthier lawn with less water use. 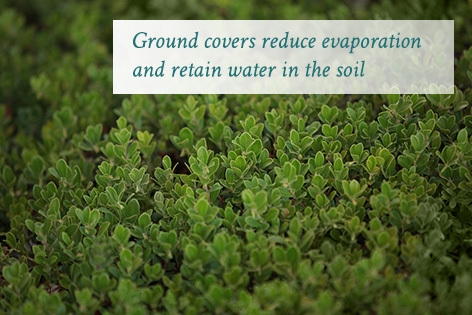 We offer alternatives to lawns – drought- and pest-resistant plants reduce water and pesticide use while retaining the beneficial cooling effect of plants.